Together with Marisa Lauren Troy of JournalingIBD.org, The Realities of IBD will talk about living with Inflammatory Bowel Disease ( Crohn’s Disease and Ulcerative Colitis ) on a daily basis. Marisa, who has been living with IBD ( Ulcerative Colitis ) for 15 years, and now lives with a permanent ostomy, is no stranger to the struggles and emotional impact that life with a chronic illness brings. 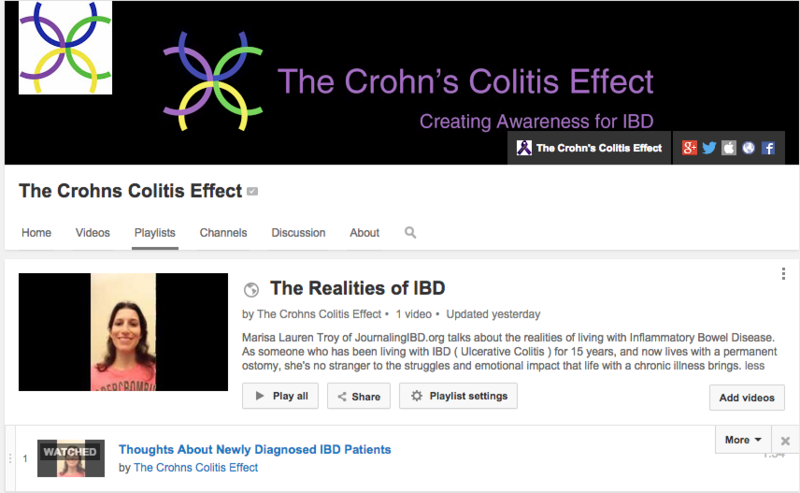 You can find The Realities of IBD on our YouTube Channel. We hope that you’ll find this new video series helpful, educational, and supportive. Please feel free to leave a comment with any questions or ideas you might have, as we love your feedback. Be sure to subscribe to our YouTube Channel to get regular updates on when new videos in this series are uploaded.